cooking, dining room table, entertaining, family, hosting, Whatever Happened to Dinner? Having company (not entertaining or a dinner party)! I enjoy having company—that’s what we called it when I was growing up. I’d ask my mom with anticipation, “Are we having company on Sunday?” We didn’t call it entertaining. In thinking about finding harmony between different types of people (especially in families and marriage), there are probably those who enjoy having people over, and those who don’t. Mother would say she was a reluctant hostess, egged on by my father who loved company (but didn’t have to do much of the work). At this point in my mother’s life, even having me and my husband there for a few days is a big deal. She shops for the Right Cereal for My Husband (even though he rarely eats cereal anymore) and stocks up on what she thinks I Have To Have for Breakfast (orange juice) because that’s what I always have at my house, and buys what she thinks We Expect to Eat at Her House (homemade sweet rolls from a friend of hers, or bakery sweet rolls, yes!). But at home we only have homemade sweet rolls on Sunday (as in here.) So having us kids for a meal is all she can manage. At 89 years of age, that is normal! I do think I got my love of having people over from my mother even though she would argue that, but it is because it was something she did frequently—something families in my church in northern Indiana did at least monthly. We would invite someone to our house for Sunday dinner, or go to someone else’s. I loved getting out the good green bubble china and the bubble goblets and the real silverware (which I’ve never had) and setting a pretty table with a centerpiece and maybe candles. I love this picture of the table in our farmhouse kitchen, recently discovered in my sister Nancy’s slides, which she transferred to print and I photographed. 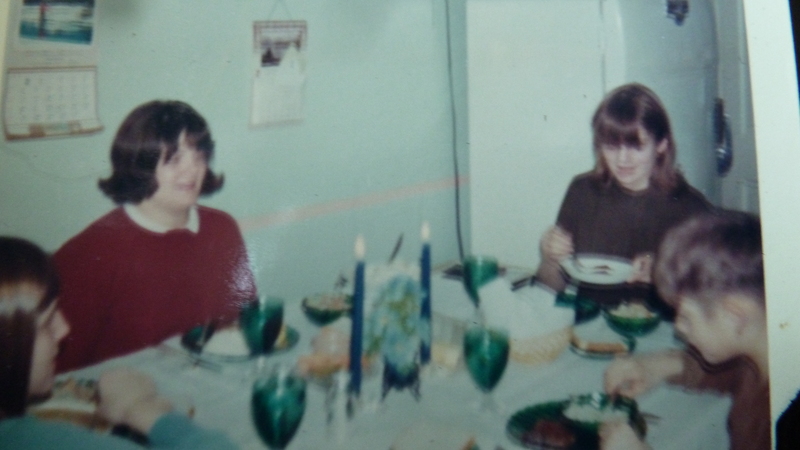 So excuse the poor reproduction, but this is Pert, far left, Nancy, yours truly, and my brother Terry, enjoying our “company meal” with Mom’s green bubbly china and goblets. We would set it all up on Saturday night. I liked helping mom prepare fancier desserts (date pudding, real whipped cream) and the roast or meatloaf or ham she would bake. 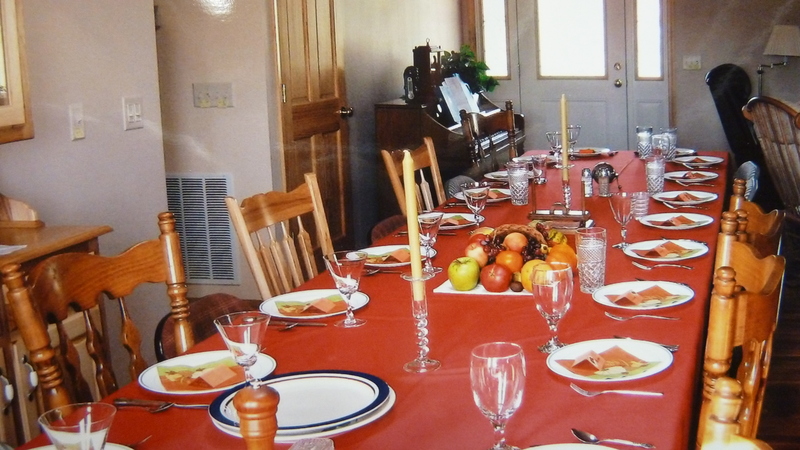 We liked setting the table “pretty” so much that sometimes when Mom and Dad would go away to a banquet and we were old enough to cook for ourselves, we would ask permission to use her best stuff and have a “company supper” just us four kids (see above). So for the first 30 years of our marriage, my husband and I enjoyed having people over even though we didn’t have a dining room or a hutch to store my grocery store china or glassware or a decent table. Our metal dinette set, covered up of course with a lace cloth. 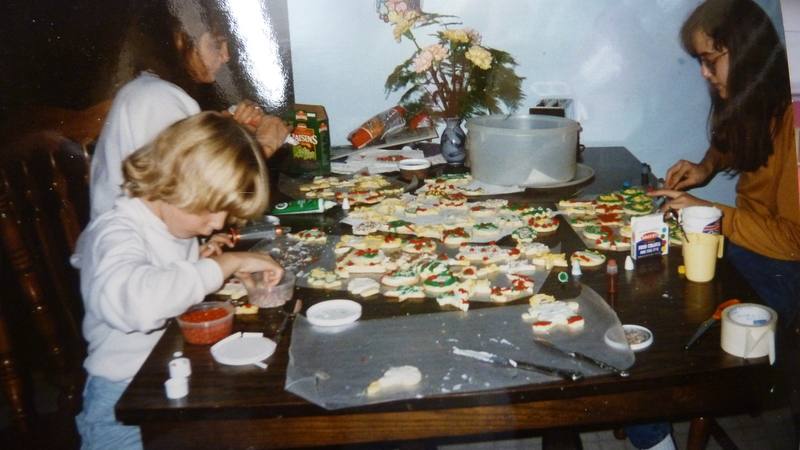 My nieces, Cindy and JoAnn were great helpers in the kitchen before my own children were old enough. We used the space we had (or ate outside) and generally made do, first with a metal dinette set that came with our house, and later a cast off table from my parents—a mobile-home-grade-particle-board-table: wowser!—when they finally got their nice long dining room table. Our fine and forgiving trailer-factory-particle-board-dining-room-table. It stood up to the creation of science fair projects and building model Globe theaters for English class. 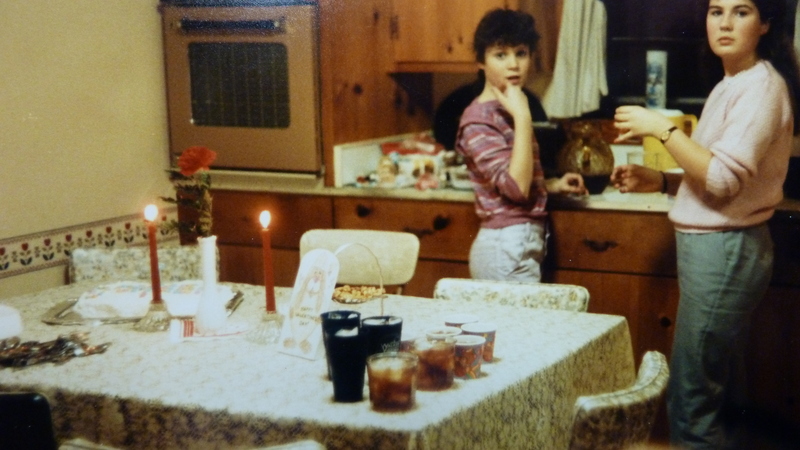 The particle board table was where our kids did homework (Doreen will thank me for sparing you the photo of her sleeping in the middle of her homework with rag curlers in her hair), where we decorated Christmas cookies, had countless birthday parties. We hosted mostly family, friends, sometimes people from church. And made do. One time for Thanksgiving we carried a huge table up from the basement that someone was giving away once, and put it in the living room so we could all get around one table. A larger table in our living room with sister-in-law Barbara in blue, brother-in-law Richard carving turkey, my father checking it out, Stuart’s father to the right. Baby Michelle at 7 months in the corner high chair. And Stuart with the plaid shirt and VERY long hair, circa 1982. Then we moved seven years ago. One of the things I looked forward to most was finally having a dining room, a hutch and a very very long dining room table. The stuff of legends (not quite King Arthur size or shape). Hickory to match our cabinets. 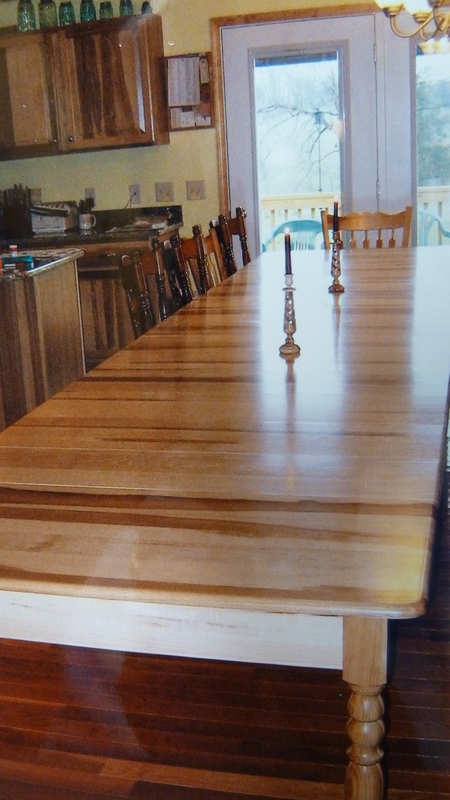 We were able to have an Old Order Mennonite in northern Indiana build it, the same guy who built my parent’s long long table. This one can seat 20, 22 in a pinch. We tend to argue about that, me trying to squeeze in as many as possible, my husband preferring to let folks have some elbow room. 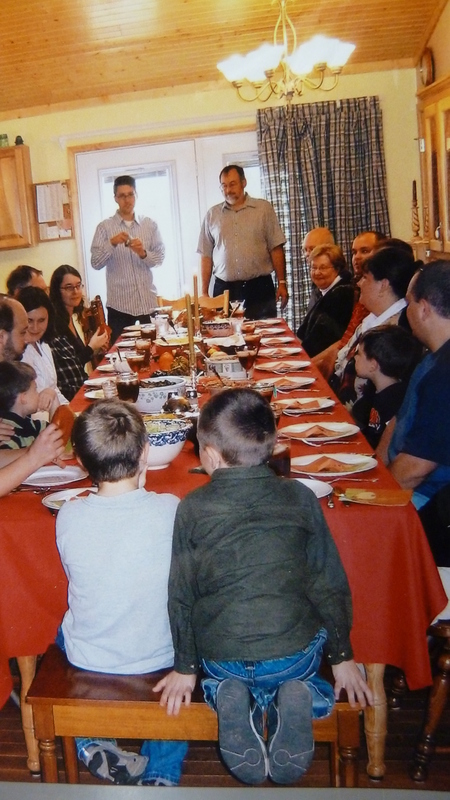 I remember the first Thanksgiving we used it and two grand nephews, gazing from the end of the table, looked like they were at the end of an airport runway. After using this table a few years, I’ll be the first to admit you can’t have a decent conversation with the whole table around such a long board, and you tend to talk in clumps with the folks next to you. So in some ways, I now prefer smaller gatherings. But it is still fun to get a whole bunch of people together around a huge table. I tend to think that tables, no matter what size or material, are special glue in families–the stuff of building memories. Other cooks with a love for holding families together around tables have written about the difference between entertaining and engaging folks over a shared meal (see Mennonite Girls Can Cook words on hospitality, and Doris Janzen Longacre’s words in More-with-Less Cookbook where she cautions that “serving guests [can] become an ego trip, rather than a relaxed meeting of friends around that most common every day experience of sharing food …” (More-with-Less Cookbook). What special memories do you have from around your table, however humble, from your growing up days? Did your mother and father like to have people over? Do you? I’d love to hear from you! 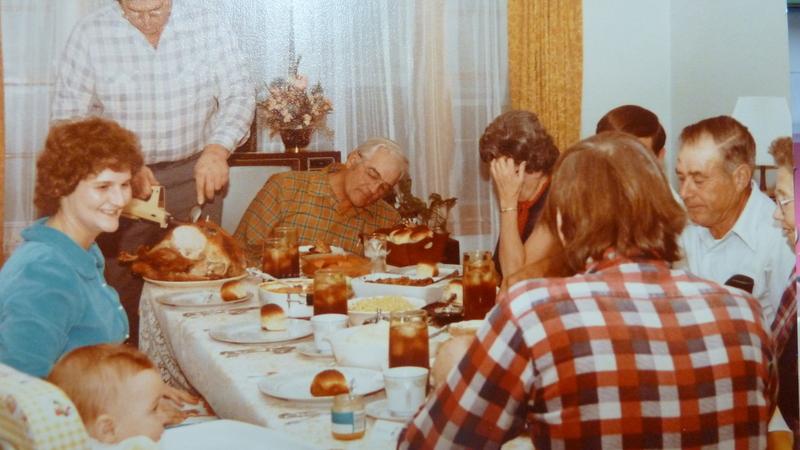 There’s much more about memories and traditions along these lines and how families today can still hang on to the custom of “gather around table” in Whatever Happened to Dinner, available here. I love this tableau of tables, Melodie. Yes, I do remember the excitement of hearing car tires roll onto the gravel stones out front which meant company is coming. Is it Clyde’s, or Landis’s, or Abe’s? we would ask, and then wait for our cousins to tumble out of the car, so we could play. We now eat on the hand-made oak table that celebrated many a holiday dinner when I was little at Grandma’s . It was passed down from Grandma (Fannie Martin) Longenecker’s side. After we got the table, Aunt Ruthie had an Amish-man (Old Order, to be sure!) make her another one. It’s long but not nearly as long as the one you picture. Yes, Knight’s of the ______Table comes to mind, the stuff of legends as you say! How precious to have those photos from so long ago. Since you following my blog, you may have noticed some blurry images on recent posts called just that “Blurry Images.” taken from very old 16 mm footage from movies shot in the 1940s and 50s. You don’t need to apologize; most people would love to have any visual record from way back. Tables as family “glue,” — love the image. Another wonderful post! Thanks for adding your stories and memories! How nice to have a table that’s been passed down. 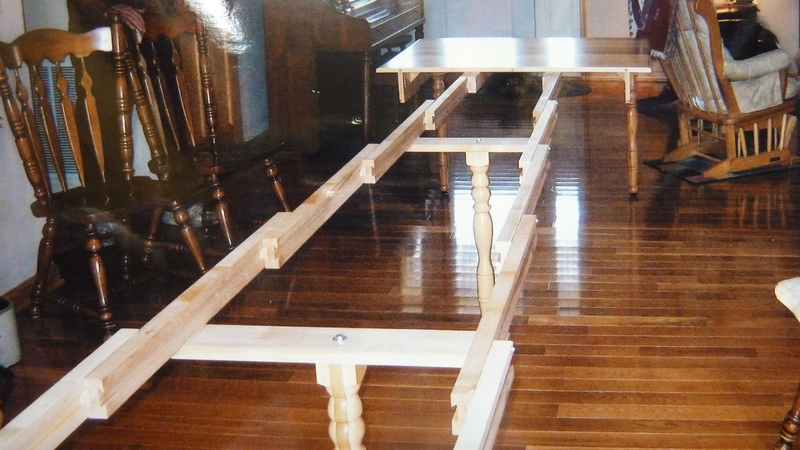 I thought about including here how I tried to bid on Mom and Dad’s table at their auction before moving to a retirement home but it soon went higher (to non-family) than I wanted to pay and I knew I could get one built for less by the same carpenter. If it had been in our family for awhile we likely would not have put it in the auction but they hadn’t owned it that long and it seemed like the only fair way to handle it as siblings. Nice auditory memory too you bring to mind: the crunch of tires on gravel. We have the big table too, in the middle of the kitchen . No “dining room”. It was built by my grandfather and seated normally 12-14. He had 10 children. It’s hard to tell from the picture but it’s probably a foot or so wider than yours. It’s a pedestal table and he built in an extension on either end that pulls out and then up from under to add more seating for company. He was a carpenter. My grandma liked to keep a cloth over it. She would buy it off the roll at the store, long enough to cover. I usually only put a cloth on for “fancy”….I have a Christmas one and a white linen one long enough. The top has been refinished numerous times, not so much to get all the little knicks out;. I don’t mind those , as many of them have a story. Just to keep it smooth and easy to clean. We always had extras for meals, it seemed, and not just on Sundays . With 15 cousins in walking distance my mother was never sure who would be at her table that night, same with my aunts. They are all excellent cooks though so we were well fed wherever we ended up. We always passed the dishes right to left. I agree that the knicks always come with a story. But how lucky, I mean lucky, to have had 15 cousins within walking distance. I wonder how many people still have that luxury. Thanks for weighing in!